1999 Cena first appeared as The Prototype, a semi-robotic character, in the Ohio Valley Wrestling organization (essentially, WWE's minor league system). 2002 Shortly after being called up to WWE's main roster, Cena adopted a new persona: Doctor of Thuganomics, a white rapper who often spat rhymes before his matches and had a penchant for backwards baseball caps and jersey combos. This also served as the beginning of a secondary career for Cena, who recorded a rap album in 2005 (which debuted at 15 on the U.S. Billboard Top 200) and was featured on the WWE soundtrack album "WWE Originals." 2005 After winning the WWE United States Championship the previous year, Cena defeated John "Bradshaw" Mayfield at WrestleMania 21 to win his first World Championship, solidifying his status as a wrestling star. 2006 Cena made his feature acting debut in WWE Studios' "The Marine" opposite Robert Patrick. 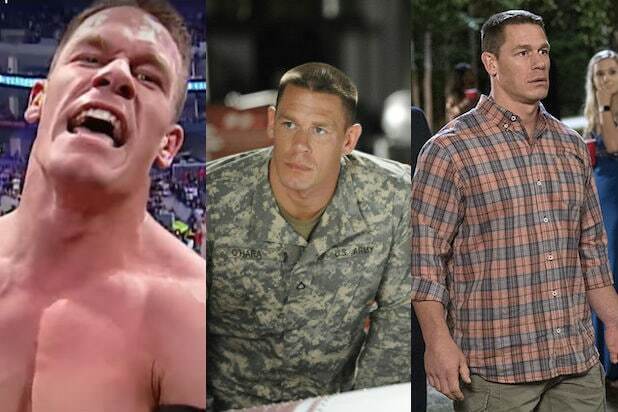 Along with his new wrestling persona as a marine private who sports flags and denim shorts, the movie helped make Cena the new American hero of the WWE. 2010 After a guest appearance on "Saturday Night Live," Cena was allowed to display his comedy chops on an episode of USA Network's "Psych," serving as a sign of things to come. Cena would return in 2017 for "Psych: The Movie." 2012 After several years of losing and regaining the WWE Championship title, Cena entered into one of the biggest feuds in wrestling history against Dwayne "The Rock" Johnson. After Johnson "screwed" Cena out of a match, Cena issued a challenge against Johnson for WrestleMania 28, exactly one year later. The highest-grossing event in WWE history ended with Johnson defeating Cena with his patented "Rock Bottom" move. 2013 Cena challenged Johnson to a rematch at WrestleMania 29, a challenge that Johnson accepted. This time, Cena emerged victorious. After the match, the two stars publicly shook hands and embraced, ending their feud. 2015 2015 turned out to be a breakthrough year for Cena, who appeared in the comedy films "Sisters," "Daddy's Home" and "Trainwreck." He also made a memorable guest appearance as himself in the final season of "Parks and Recreation." 2015 (cont'd) In addition to his wrestling fans, Cena is known and beloved for his philanthropy, particularly his work with the Make-A-Wish Foundation. Cena began his relationship with the organization in 2004 and has since granted over 500 wishes. 2016 In 2016, Cena began hosting the Fox reality series "American Grit," which pitted civilians against each other in grueling physical challenges under the guidance of seasoned military vets. 2017 Leaning into his image, Cena opened the year by playing a soldier in Doug Liman's war thriller "The Wall" opposite Aaron Taylor-Johnson. He then appeared in "Daddy's Home 2" before voicing a gentle bull with a big heart in "Ferdinand." 2017 (cont'd) After hosting the Australian Kids' Choice Awards in 2008, Cena was invited to host the Kids' Choice Awards in 2017. After he charmed and slimed his way into the audience's hearts, he was invited to host again this year. 2018 Cena will soon appear in his first comedic lead role opposite Leslie Mann and Ike Barinholtz in "Blockers." He will also co-star in the "Transformers" spinoff "Bumblebee" with Hailee Steinfeld, as well as voice recurring villain Baron Draxum in Nickelodeon's new animated series "Rise of the Teenage Mutant Ninja Turtles."